SAN FRANCISCO — If life ever existed on Mars, it may have betrayed its presence with a distinctive magnetic signature that a future rover could detect, a new study suggests. A mission to hunt for life on the Red Planet could look for deposits of magnetite or other iron-bearing minerals in Martian sediment mounds. A relatively even smattering of magnetic grains throughout such mounds would be strong evidence of long-ago capture by sticky microbial "biofilms," the idea goes. This magnetic method holds promise as a definitive test for Martian life, researchers said. Scientists have been searching for such a black-and-white metric for decades, but most options offer many shades of gray. Here on Earth, communities of micro-organisms commonly build large sedimentary mounds called microbialites. The microbes clump together in slimy mats or films, which grow layer by layer as the microbes reproduce, creating microbialites. The most famous of these mounds are stromatolites, which form in shallow water and preserve a fossil record of life on Earth that stretches back 3.5 billion years. If a rover stumbled across a stromalite-looking mound on the surface of Mars, scientists would doubtless get very excited. But that discovery would not in itself be definitive evidence of past or present Martian life, since similar mounds can also form without the assistance of living organisms. Further, microbes don't fossilize well, so the rover might not find anything in a sample even if the mound was once crawling with Red Planet bacteria. A schematic showing how sticky biofilms trap more magnetite — and over a broader area — than mounds that formed abiotically (without the aid of living organisms). Some researchers think that future life-detection missions to Mars could search for such a magnetic signature. But biofilms are sticky; microbialites trap and bind sediments and various minerals, including magnetite. Petryshyn and her team wanted to see if this magnetite accumulation could serve as a "biosignature," or convincing sign of life. So they performed some experiments. The researchers harvested microbial mat samples from southern California. They put the samples into a water-filled tank and inclined them at a variety of angles — from 0 degrees (horizontal) to 90 degrees (vertical). Then they introduced magnetite particles. They did the same thing with the mat samples swapped out for a carbonate control (microbialites generally contain a lot of carbonate minerals). The team found that the mat samples trapped much more magnetite than the control. In the control sample, magnetite particles concentrated at the bottom, as dictated by the laws of gravity. But the mat grabbed lots of magnetite across its entire surface, showing just how sticky biofilms are. Even vertically tilted mat samples snagged a lot of magnetite, while the stuff slid right off tilted control samples. 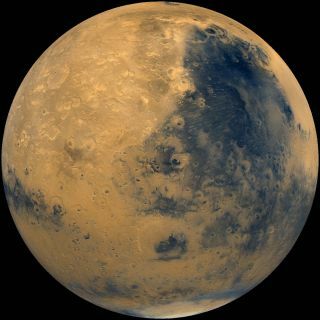 The team's experiments suggest that a future rover mission could search Martian stromatolite-like mounds for magnetite or other iron-bearing minerals, Petryshyn said. Any mounds that exhibit lots of these minerals throughout their structure — not just at the bottom — were likely built by microbes. To do the job, a rover would just need a small drill and an instrument that induces a magnetic field, a flight-ready version of the table-top device the researchers used for their study. That shouldn't be too tough, Petryshyn said, pointing out that robot explorers have been outfitted with more-sophisticated gear in the past. For example, NASA's Curiosity rover, which launched toward the Red Planet last month, carries a suite of 10 instruments, including a mass spectrometer. "If you can put a mass spec on a rover, you can put this on a rover," Petryshyn told SPACE.com. Of course, the method Petryshyn and her colleagues are proposing would be useful only if rovers spot any suspicious-looking mounds on the Martian surface. That hasn't happened yet. But if it does, researchers would probably want a good way to investigate whether or not it was biological in origin. "If we found a stromatolite-like structure on Mars, then the fight would begin," Petryshyn said.